Devorn Jorsling and his Defence Force teammates will enjoy a very merry Christmas this year, as they hammered Jap’s North East Stars 6-1 at the Hasely Crawford Stadium yesterday to leap to the top of the TT Pro League standings. Photo: Defence Force winger Jemel Sebro (far left) and Devorn Jorsling (far right) celebrate with teammates during a 2014/15 Pro League fixture against W Connection. 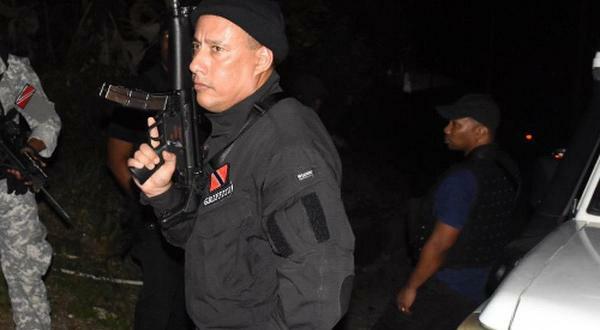 The Army/Coast Guard combination treated the Sangre Grande-based team to a ruthless display of counter attacking football, as they shredded the Stars back line all evening en route to their massive victory, which will keep them atop of the Pro League standings at the start of 2016. 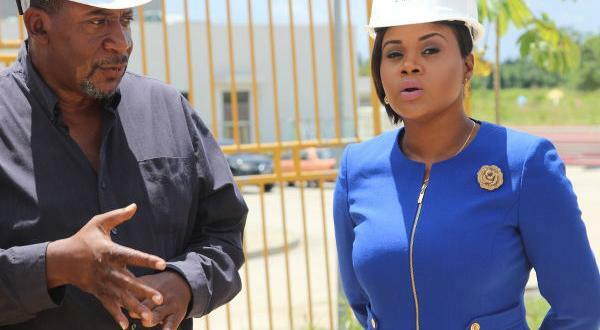 There is also the matter of the Rawle Fletcher Trophy and TT$50,000 and TT$10,000 cash prize for the first place team and best player respectively at the end of round one. And how fitting it is that the former teammates of the fallen soldier, Fletcher—who was murdered on 22 December 2013—are perched at the top of the table with just one game day to go in Round One of the league’s 2015/16 edition. Stars simply weren’t ready to take the hit, as Jorsling helped himself to a hat-trick by the 52nd minute. 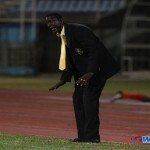 2015 Gold Cup standout Keron “Ball Pest” Cummings gave Stars a glimmer of hope with a penalty just after the hour mark. 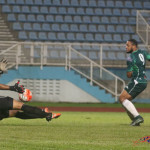 But that was all that went right for Stars, as Defence Force added three more second half items through ex-Trinidad and Tobago National Under-20 winger Kishun Seecharan, midfield hardman Sean Narcis and substitute Stephan Campbell. 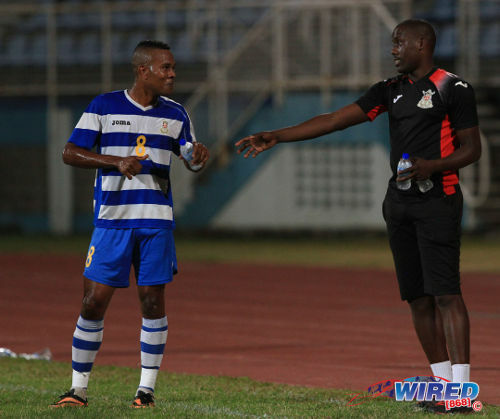 Photo: Defence Force utility player Curtis Gonzales (left) and Defence Force manager Devin Elcock. Jorsling, the Pro League’s all-time leading scorer, was the Army’s most successful sniper again yesterday but he had an abled accomplice in Ross Russell Jr, who created three goals for his teammates—two of which fell to the clinical Jorsling in the first half. There was little sign of what was to follow in the first half hour, as both teams fought for midfield dominance. 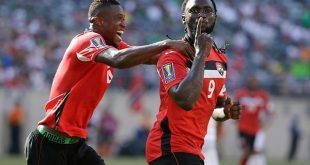 Defence Force coach Marvin Gordon seemed intent on swatting away Stars’ number one pest, Cummings, as Narcis paid close attention to the talented “Soca Warriors” midfielder. Giant Defence Force centre half Glen Franklyn had two early chances from set pieces but headed wide off a Jorsling free kick in the seventh minute and a Curtis Gonzales corner kick in the 16th minute. The soldiers were just allowing their prey to get comfortable though. Jorsling duly opened the floodgates on the half-hour mark with a crisp, right-footed volley past Stars goalkeeper Shane Mathis after a lovely exchange of passes between skipper Jerwyn Balthazar and Russell Jr.
Photo: Defence Force striker Devorn Jorsling. He then doubled the lead, nine minutes later, with an instinctive touch from close range to capitalise on a rocket-like cross by the lanky Russell Jr.
Jorsling’s hattrick and 141st Pro League goal came seven minutes after the resumption, as he rounded Mathis to score after a neat through pass in a sweeping right side move. Cummings gave the Stars a glimmer of hope in the 64th minute, as he buried a penalty after tricking defender Rodell Elcock into a rash tackle in the 18-yard box. 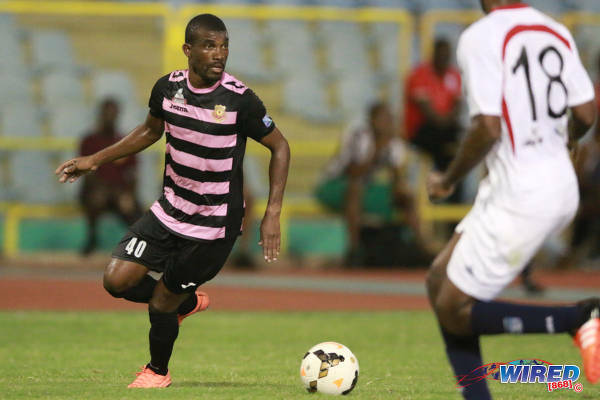 But Seecharan dashed any chance of an early Christmas miracle for his opponents, four minutes later, as he cheekily lobbed Mathis from close range after a rampaging run and cross by Russell Jr down the left flank. By now, coach Roland Clarke’s players were praying for the final blow of Rashby McPhie’s whistle. But the soldiers were not done yet, as Narcis and Campbell thumped in efforts from close range in the final 15 minutes to seal the 6-1 mauling. 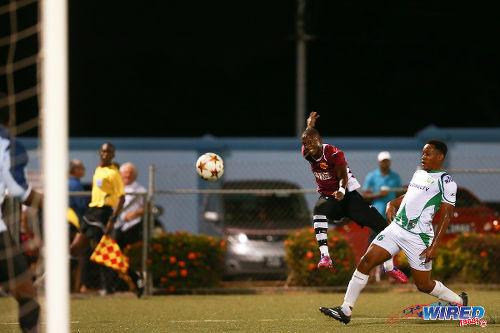 Photo: North East Stars attacker Keron Cummings (left) goes for goal during a 2014/15 Pro League fixture while W Connection defender Maurice Ford looks on. In the second game of yesterday’s double header, St Ann’s Rangers missed two penalties but still got the better of Point Fortin Civic with a one-nil triumph. Attacker Keron Cornwall’s close range finish in the 40th minute was enough to give coach Angus Eve his second Pro League win of the campaign. 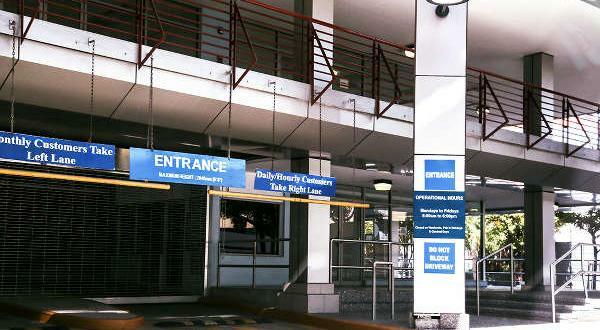 Elsewhere, Bankers Insurance Central FC rebounded from the surprise sacking of coach Ross Russell to thump Morvant Caledonia United 4-0 at the Larry Gomes Stadium in Malabar. 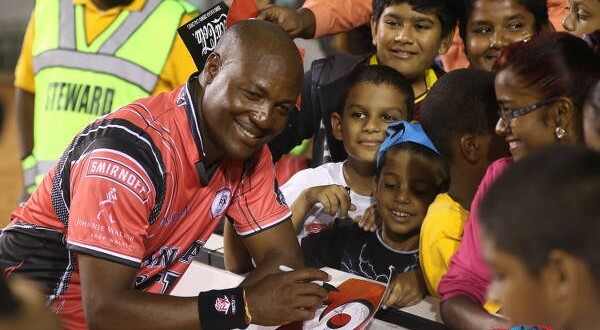 The “Couva Sharks”, who were led by interim head coach and former assistant Dale Saunders, got items from Jamal Jack, Jason Marcano, Leston Paul and Marcus Joseph to storm pass the ninth place Caledonia team. The Sharks, who have now seen the backs of three coaches in 2015, sit in third spot and are only three points away from leaders Defence Force. 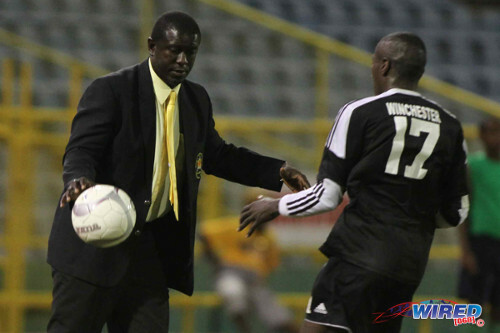 Photo: Then Defence Force coach Ross Russell (left) stops the ball for Central FC attacker Rundell Winchester during the 2013 First Citizens Cup final. Former English international Terry Fenwick replaced Serbian Zoran Vranes at Central’s helm in March, while Russell replaced the feisty Fenwick in July. Yesterday, Vranes opted to watch the massacre of North East Stars at the Hasely Crawford Stadium while former Connection stand-out player and employee Jose Luiz Seabra sat next to Central operations director Kevin Harrison at the Larry Gomes Stadium. The Pro League is sure to have even more intrigue when the season resumes next month. 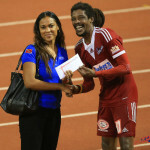 Defence Force (4-2-3-1): 25.Sheldon Clarke (GK); 8.Curtis Gonzales, 6.Rodell Elcock, 2.Glynn Franklyn, 21.Akile Edwards; 99.Jerwyn Balthazar (captain), 4.Dave Long (52.Stephan Campbell 69); 30.Kishun Seecharan (7.Jelani Felix 82), 18.Sean Narcis, 17.Ross Russell Jr; 9.Devorn Jorsling (16.Kellon Serette 80). Unused Substitutes: 80.Aaron Enil (GK), 13.Marvin Jones. North East Stars (4-2-3-1): 1.Shane Mathis (GK); 25.Keryn Navarro, 19.Glenton Wolffe, 4.Jesus Perez, 26.Carey Brown; 21.Neil Mitchell (8.Neveal Hackshaw 35), 24.Adrian Noel; 5.Alanzo Adlam, 6.Duane Muckette (Chike Sullivan 56), 10.Keron Cummings; 28.Dillon Jagasar (23.Brendon Figuera 46). Unused Substitutes: 22.Cleon John (GK), 27.Quincy Charles, 39.Taryk Sampson, 40.Jomoul Francois. Photo: Defence Force striker Devorn Jorsling (right) holds off St Ann’s Rangers defender Seon Thomas during 2014/15 Pro League action. 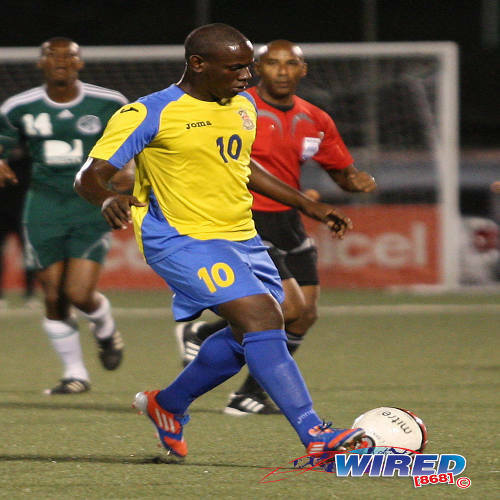 St Ann’s Rangers 1 (Keron Cornwall 40), Point Fortin Civic 0, Hasely Crawford Stadium. Stars supporters had more than enough to say to that referee though… lol. lol. i swear though…sometimes I’m more entertained by the off the field antics than the actual match. Nah, I don’t think so. Haven’t seen Sando much so far. I’m going to have make an extra effort when the matches resume just to try to get a glimpse of this supporter. lol.